Though a variety of upper gastrointestinal symptoms are common among diabetics, their true prevalence, relationships to diabetes control, and other complications as well as underlying upper gastrointestinal (GI) sensori-motor dysfunction are often unclear. For example, though esophageal dysmotility is common in diabetes, its clinical significance in terms of symptomatology or as an indicator of gastric motor dysfunction remains to be defined. Similarly, studies on the prevalence of gastroesophageal reflux disease among diabetics have arrived at conflicting conclusions regarding the true prevalence of this association; available data, in contrast, suggests that diabetics are at increased risk for the development of Barrett’s esophagus and esophageal cancer. 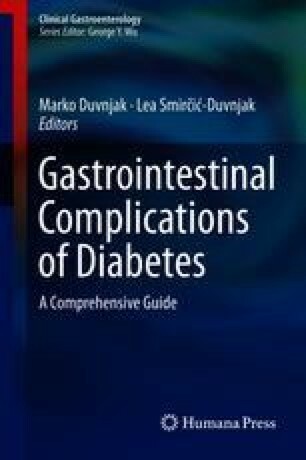 Gastroparesis is the best known and most extensively studied of the upper GI complications of diabetes; here again relationships between symptoms, gastric emptying rate, and glycemia are complex and pose significant clinical challenges. Though traditionally ascribed to the effects of autonomic neuropathy, more recent studies have revealed a variety of morphological, ultrastructural, and functional abnormalities in the enteric neuromuscular apparatus. Koduru P, Irani M, Quigley EMM. Definition, pathogenesis and management of that cursed dyspepsia. Clin Gastroenterol Hepatol. 2017. https://doi.org/10.1016/j.cgh.2017.09.002. [epub ahead of print]. Parkman HP, Hallinan EK, Hasler WL, Farrugia G, Koch KL, Nguyen L, et al. Early satiety and postprandial fullness in gastroparesis correlate with gastroparesis severity, gastric emptying, and water load testing. Neurogastroenterol Motil. 2017;29. https://doi.org/10.1111/nmo.12981. [epub ahead of print]. Grover M, Bernard CE, Pasricha PJ, Parkman HP, Gibbons SJ, Tonascia J, et al. Diabetic and idiopathic gastroparesis is associated with loss of CD206-positive macrophages in the gastric antrum. Neurogastroenterol Motil. 2017;29. https://doi.org/10.1111/nmo.13018. [epub ahead of print]. Eisenman ST, Gibbons SJ, Verhulst PJ, Cipriani G, Saur D, Farrugia G. Tumor necrosis factor alpha derived from classically activated “M1” macrophages reduces interstitial cell of Cajal numbers. Neurogastroenterol Motil. 2017;29. https://doi.org/10.1111/nmo.12984. [epub ahead of print].